Vintage clothing the cat's Meow! Munn is the owner of the newly created, and unusually named, Meow! Her new store at 10 Carden St., formerly the location of the 12th Night Music Shoppe, features almost-new and vintage clothing, primarily for women. It carries the strange name because she's fanatical about felines. "I'm passionate about cats," Munn said recently, noting she's not only a pet lover, but personally owns collectibles with cat themes. That's why she hired local cartoonist and illustrator Seth to incorporate cat motifs, like cat caricatures, on the walls of her store. You could say the new business is a labour of love. 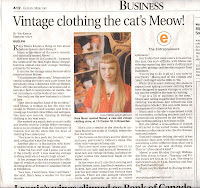 "I got into doing this kind of by accident," said Munn, a woman in her 30s who was raised in Waterloo and Guelph and from a young age hoarded collectibles and antiques, like toys and records, turning to vintage clothing in her teen years. She worked as a retail clerk at an art crafts and jewelry store in Guelph before earning a degree in psychology from the University of Guelph, but all the while felt the draw of clothing from yesteryear. "You have to be a pack rat, for sure," she said, noting that's just the beginning. Another plus is "a fascination with history and the style of old things," Munn said. "I like the fun stuff and I guess you'd call it the kitschy stuff. I was wearing vintage clothing back when I went to high school." In her younger days she scoured the offerings of vendors at the twice-annual vintage clothing show at Toronto's Canadian National Exhibition. "As a teen, I went there. Now, I sell there," she said. She's been a vendor for the past decade. She's also a vendor at the Aberfoyle Antique Market just south of Guelph, where she has two booths. One focuses on furniture and the other on antiques, particularly 1950s-era items. The other sells vintage clothing only. The lower-level store opened Nov. 10. Its interiors are split half-and-half between almost-new and vintage clothing, including designer names like American Eagle on the newer side. In the store you'll also find evening and party dresses, coats, hand-knit sweaters, suit jackets, hats and jewelry, as well as purses, scarves and other items from various time periods. There are also antique valentine cards and postcards, as well as "other ephemera." You'll also find some men's accessories, like hats, ties and cufflinks, with Munn considering expanding into men's clothing next year after getting considerable requests from customers. While this is used clothing, she plans to expand next spring into new clothing that's been designed to appear vintage or retro to tap into the trend for this type of clothing. "I go to a lot of auctions in the area," Munn said, noting in particular Toronto-area clothing warehouses and attractions like Kensington Market. She also sells items on consignment for others at her store. Munn said so far she's experienced a mix of customers, including students and environmentalists attracted by the idea of vintage clothing getting a new lease on life. But, she added, a cross-section of Guelph is attracted to the varied items, including business professionals who like the dresses, suits and jackets. Used and vintage clothing, she said, is less expensive than new, with the emphasis on something a little different than what you'd find on shelves in new clothing stores. They're "often one-of-a-kind."